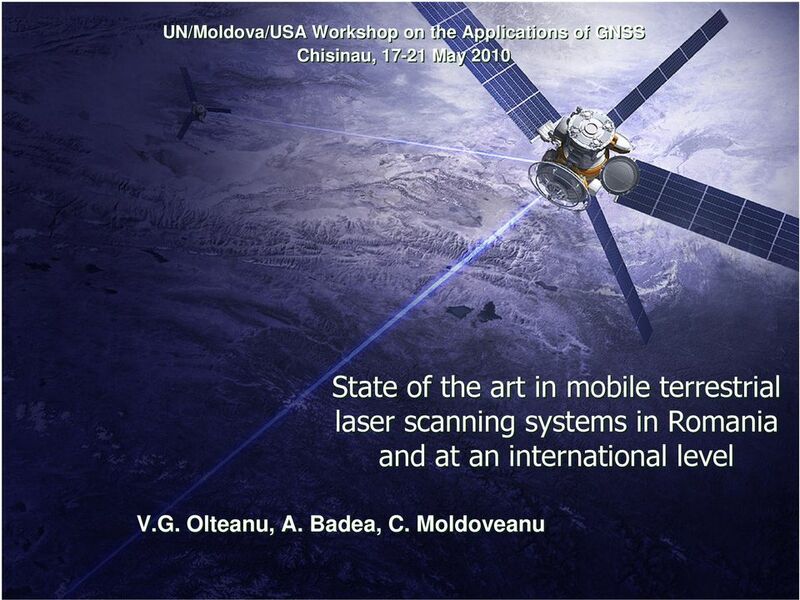 Download "State of the art in mobile terrestrial laser scanning systems in Romania and at an international level"
3 Historic development laser scanning systems The first laser scanning systems used on airborne platforms emerged in the 70 s but due to the fact that there were no direct georeferencing solutions at that moment they had limited use and their applications regarded the atmosphere, the oceans, the glaciers, etc. 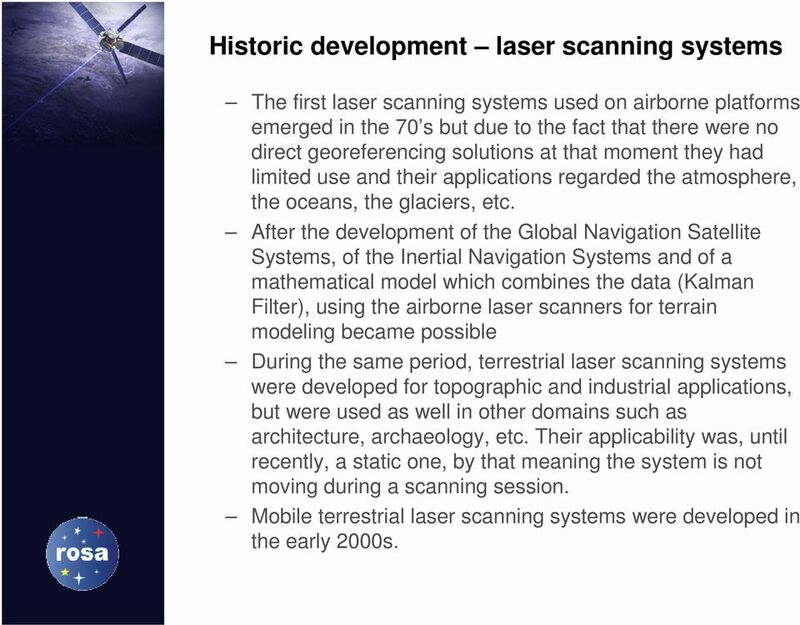 After the development of the Global Navigation Satellite Systems, of the Inertial Navigation Systems and of a mathematical model which combines the data (Kalman Filter), using the airborne laser scanners for terrain modeling became possible During the same period, terrestrial laser scanning systems were developed for topographic and industrial applications, but were used as well in other domains such as architecture, archaeology, etc. Their applicability was, until recently, a static one, by that meaning the system is not moving during a scanning session. 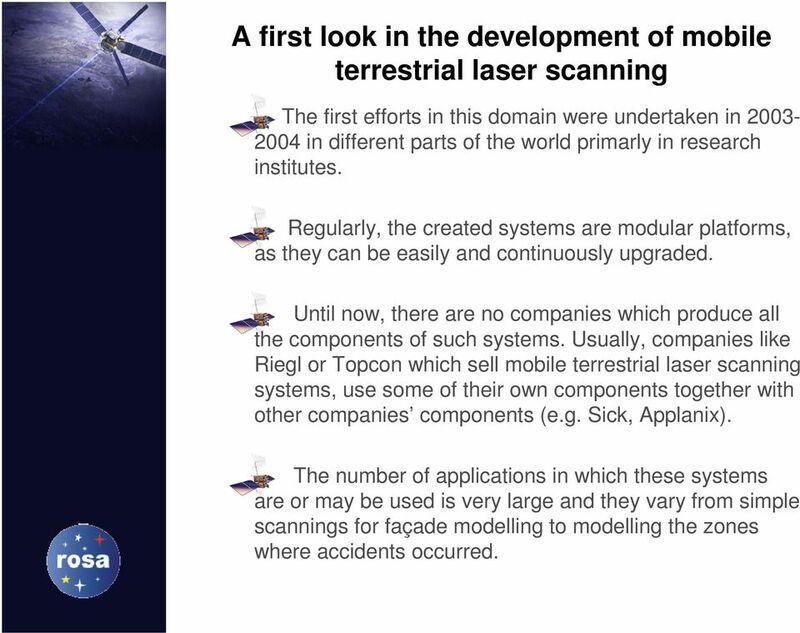 Mobile terrestrial laser scanning systems were developed in the early 2000s. 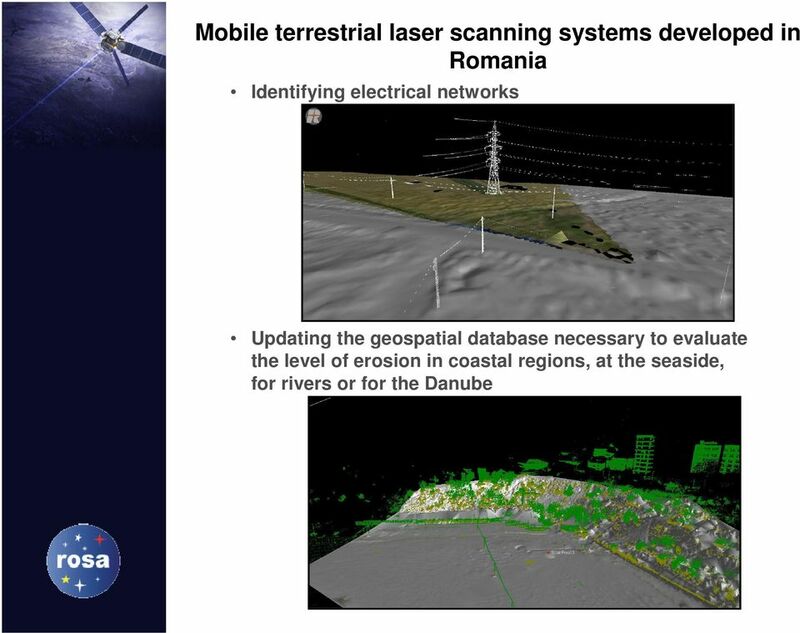 4 A first look in the development of mobile terrestrial laser scanning The first efforts in this domain were undertaken in in different parts of the world primarly in research institutes. Regularly, the created systems are modular platforms, as they can be easily and continuously upgraded. Until now, there are no companies which produce all the components of such systems. 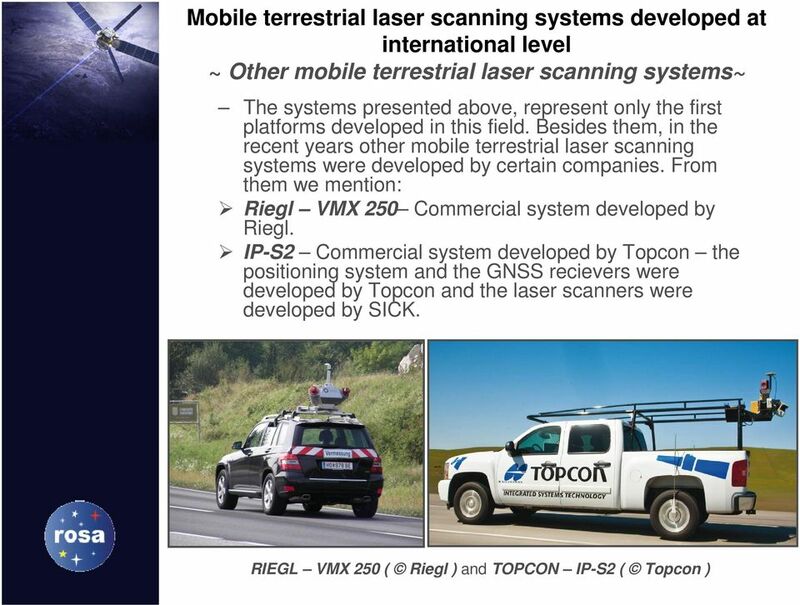 Usually, companies like Riegl or Topcon which sell mobile terrestrial laser scanning systems, use some of their own components together with other companies components (e.g. Sick, Applanix). 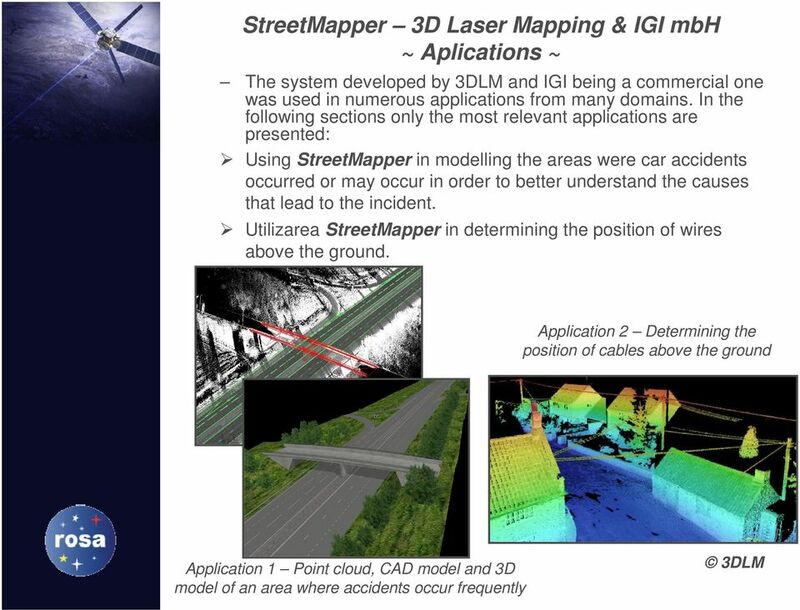 The number of applications in which these systems are or may be used is very large and they vary from simple scannings for façade modelling to modelling the zones where accidents occurred. 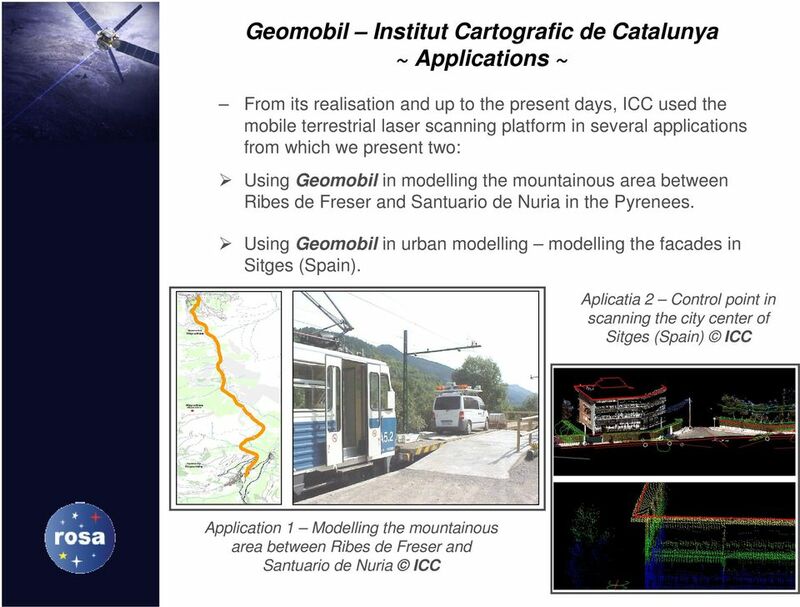 12 Mobile terrestrial laser scanning systems developed at international level 3) LYNX Mobile Mapper TM Optech Inc. LYNX Mobile Mapper is one of the newest mobile terrestrial scanning platforms. The system s architecture is similar to the ones presented before; only the type of instruments used is different. 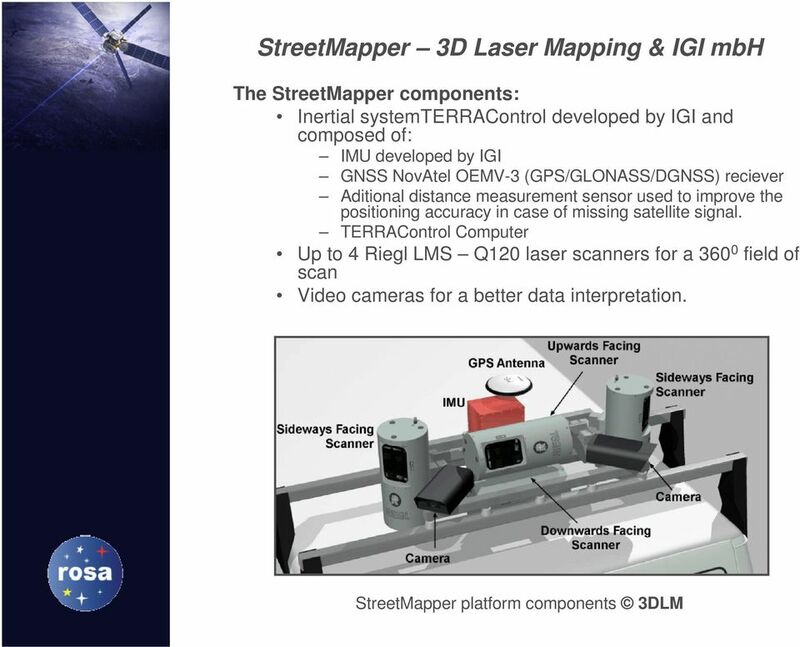 Similar to StreetMapper, the system developed by Optech Inc. is able to provide a field of scan by incorporating up to 4 laser scanners designed by themselves. 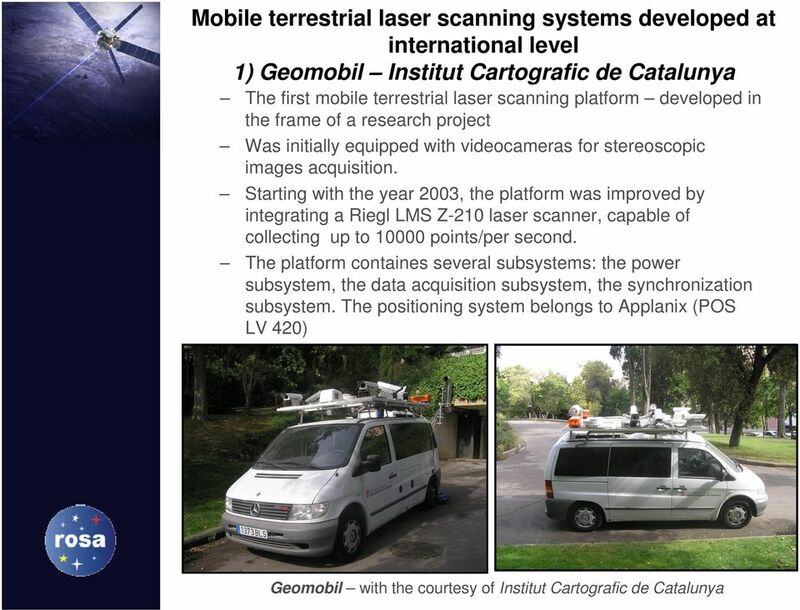 The positioning system was designed by Applanix (POS LV 420) and the GNSS recievers belong to Trimble. 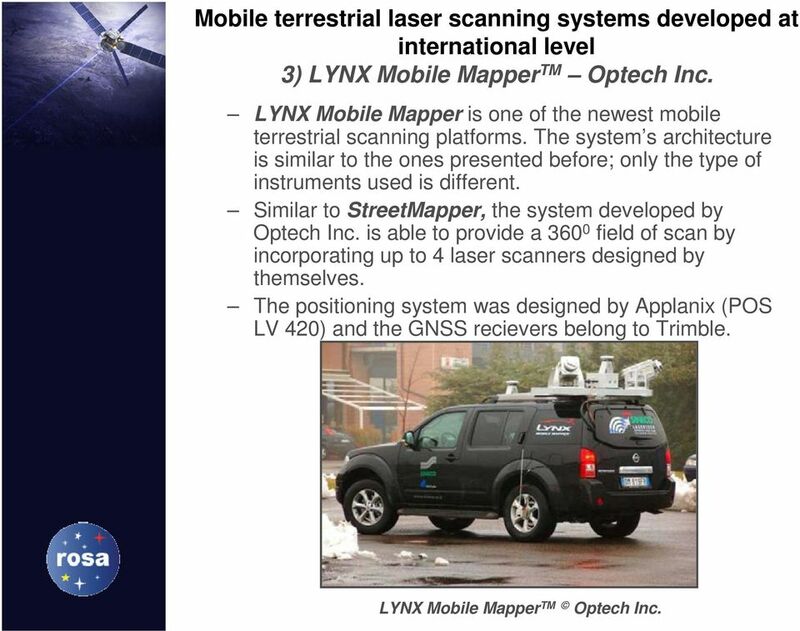 LYNX Mobile Mapper TM Optech Inc.
13 LYNX Mobile Mapper TM Optech Inc. ~ Applications ~ Like StreetMapper, LYNX Mobile Mapper is a commercial system and was used in numerous applications from which we will present two of the most relevant. 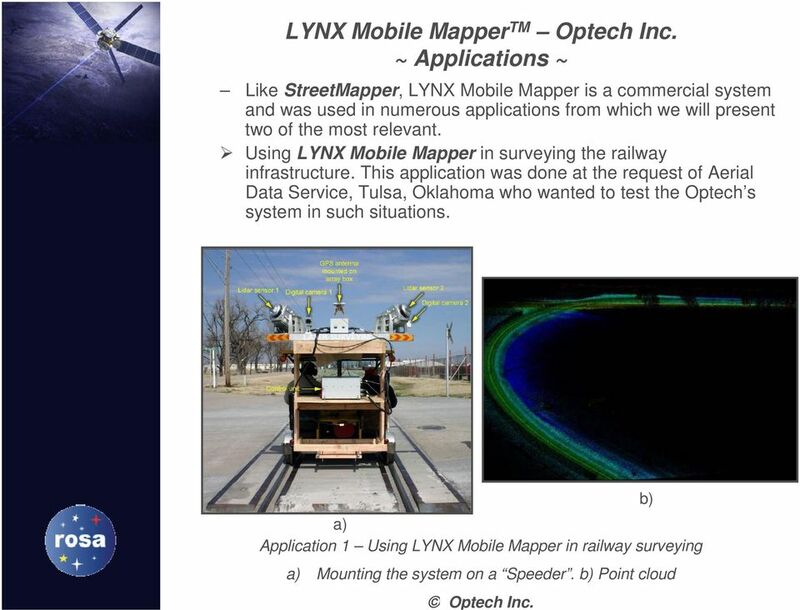 Using LYNX Mobile Mapper in surveying the railway infrastructure. This application was done at the request of Aerial Data Service, Tulsa, Oklahoma who wanted to test the Optech s system in such situations. 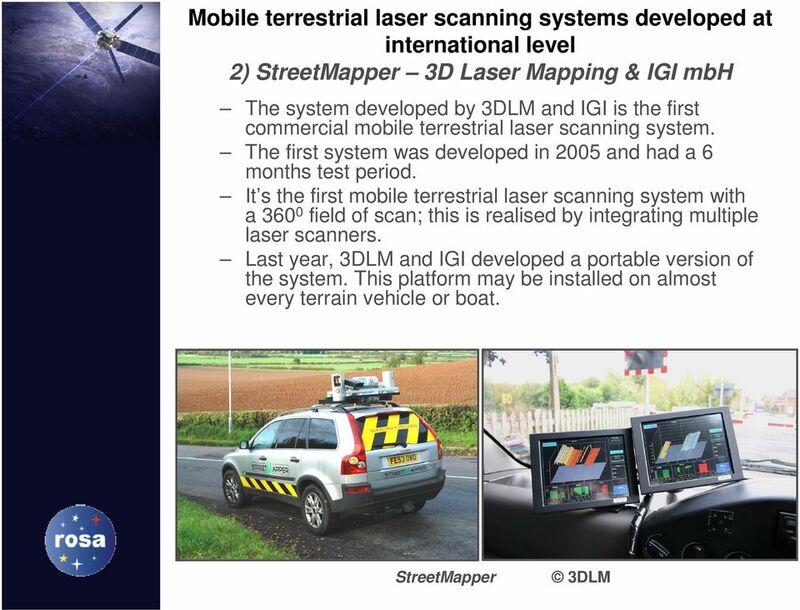 b) a) Application 1 Using LYNX Mobile Mapper in railway surveying a) Mounting the system on a Speeder. 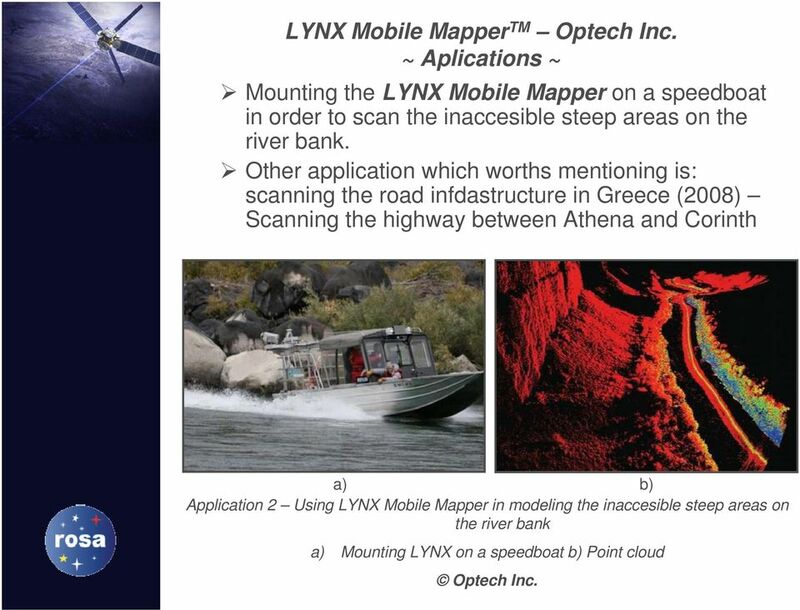 b) Point cloud Optech Inc.
14 LYNX Mobile Mapper TM Optech Inc. ~ Aplications ~ Mounting the LYNX Mobile Mapper on a speedboat in order to scan the inaccesible steep areas on the river bank. 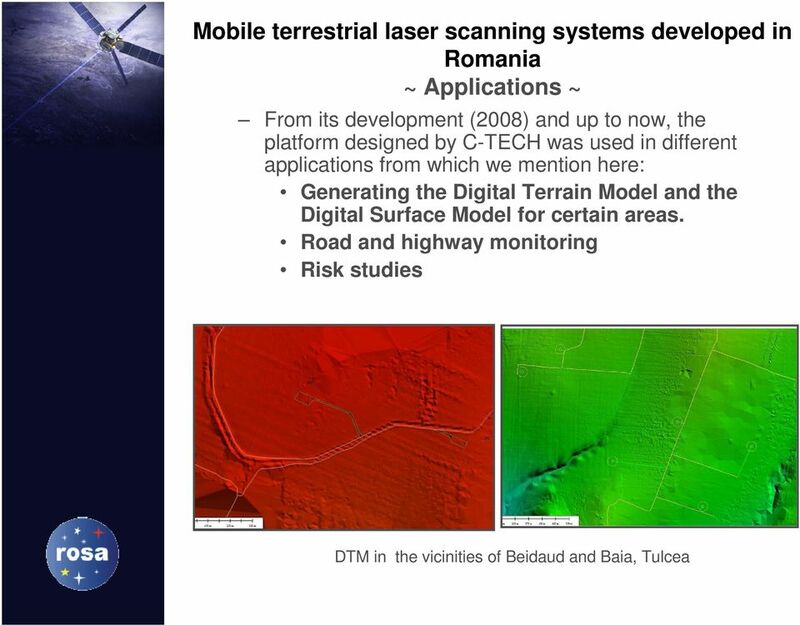 Other application which worths mentioning is: scanning the road infdastructure in Greece (2008) Scanning the highway between Athena and Corinth a) b) Application 2 Using LYNX Mobile Mapper in modeling the inaccesible steep areas on the river bank a) Mounting LYNX on a speedboat b) Point cloud Optech Inc.
16 Mobile terrestrial laser scanning systems developed in Romania In Romania there is only one such system known to pe developed or used. It was developed based on a research project, financed in the frame of PNCDI II. The platform developed by S.C. C-TECH S.R.L. (Constanta) differs from the ones developed at international level only through the type of instruments used. 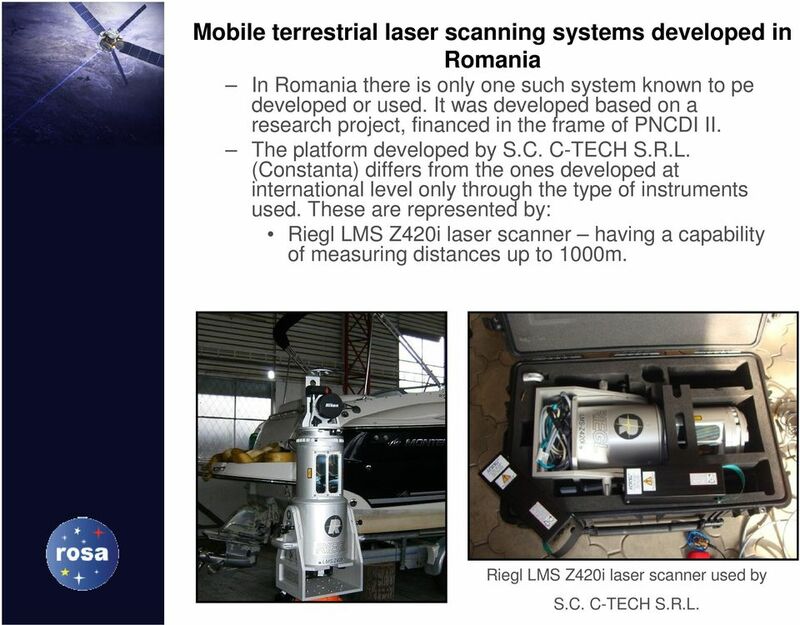 These are represented by: Riegl LMS Z420i laser scanner having a capability of measuring distances up to 1000m. Riegl LMS Z420i laser scanner used by S.C. C-TECH S.R.L. 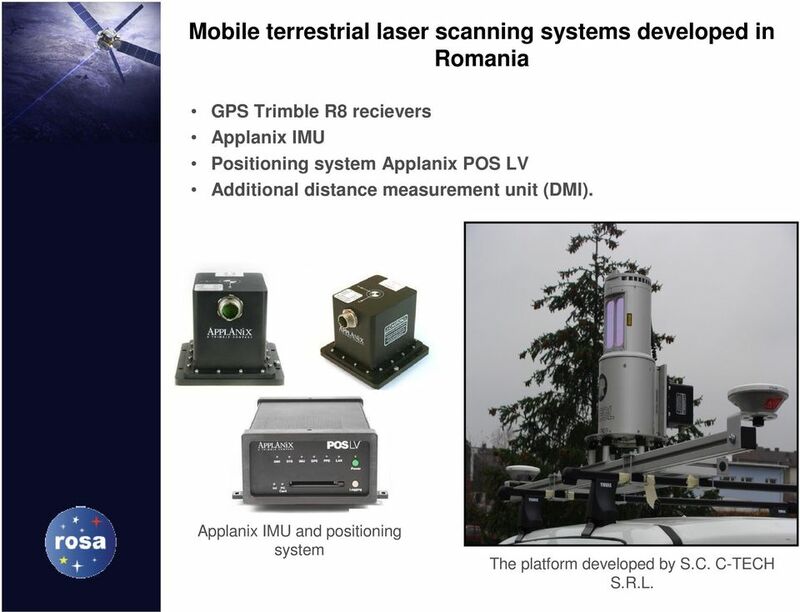 17 Mobile terrestrial laser scanning systems developed in Romania GPS Trimble R8 recievers Applanix IMU Positioning system Applanix POS LV Additional distance measurement unit (DMI). Applanix IMU and positioning system The platform developed by S.C. C-TECH S.R.L. 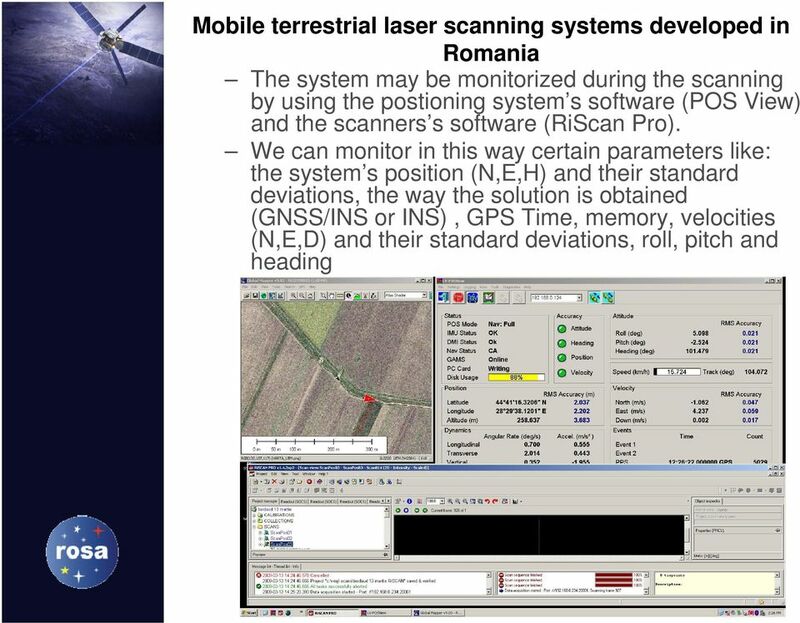 21 Conclusions The development of mobile terrestrial laser scanning systems enhanced the geospatial data collection necessary in order to obtain the DSM or other similar products A shortcoming of these equipments is represented by their high development / aquisitioning costs Developing such systems still represents a field of research at Romania s level but at international level as well. 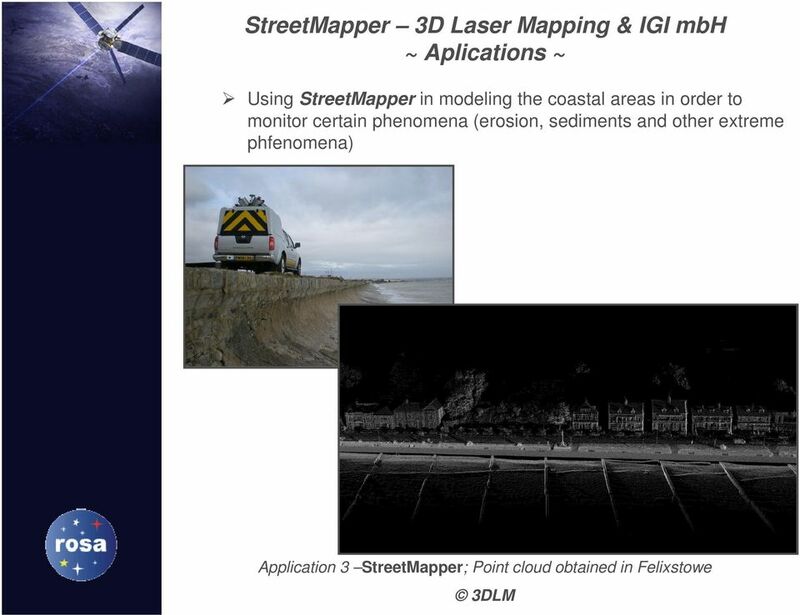 The research is oriented on: Improving the positioning accuracy Reducing the system s size Portability Improving the algorithms used in the postprocessing of the point cloud since there is no dedicated software and the existing ones are extremely time consuming. 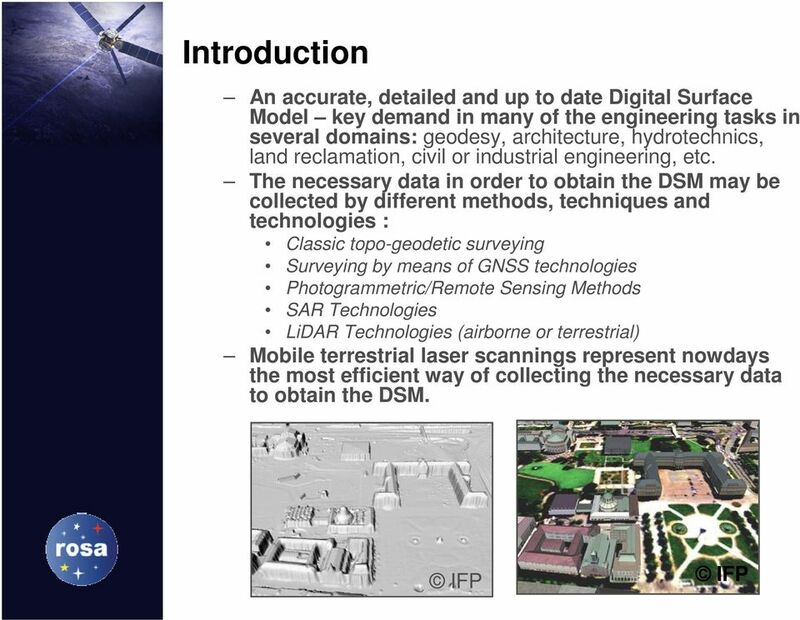 It should be studied the impact of future global satellite systems on the position accuracy. Point clouds colorized by elevation of downtown Detroit, MI. 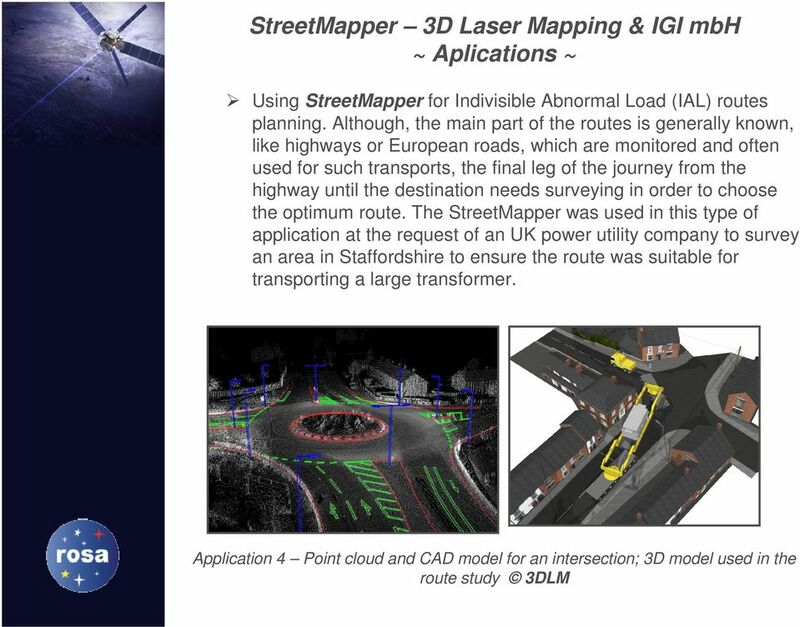 3D Laser Scanning Technology Rugged hardware and powerful software combined with streamlined survey workflow Maptek specialises in the research, development and application of 3D laser scanning technology.